Acton Town Hall is located at 472 Main Street, Acton, MA 01720; 978-929-6620. Photo: Faulkner Homestead, ca. 1702, 5 High Street, Acton, MA. This is the oldest pre-Revolutionary structure remaining in Acton. Listed on the National Register of Historic Places in 1971. Photographed by User:John Phelan (own work), 2010, [cc-by-3.0 (creativecommons.org/licenses/by/3.0)], via Wikimedia Commons, accessed May, 2013. Prior to its settlement by farmers from Concord, the area that became present-day Acton was frequented by Nipmuck-related Native Americans who may have practiced some limited agriculture, hunting, fishing and gathering. Many areas of Acton were good campsites, especially areas along Nashoba and Fort Pond Brooks as well as Nagog Pond. Artifacts from early hunting and fishing villages have been found in Acton, in the Pinehawk site in the south of Acton and in the area of Nagog Pond. Nearly all of present day Acton's 12,990 acres is comprised of portions of four early land grants. The two largest were: Major Simon Willard's Grant (which became Iron Work Farm), and the New Grant or Concord Village. Next to these grants was the Praying Indian Township of Nashoba Plantation, which lay entirely outside present-day Acton. The early colonial landscape included large areas of meadows. These prime grazing lands were the reason Concord sought to annex these additional lands in 1655. The earliest European settler was John Law, Concord's shepherd, who built his home in 1656 on School Street near Lawsbrook Road. By 1730 there were at least two-dozen settlers scattered across the Town. In 1735 Acton was incorporated as a town with the same Open Town Meeting and Board of Selectmen that are still here today. 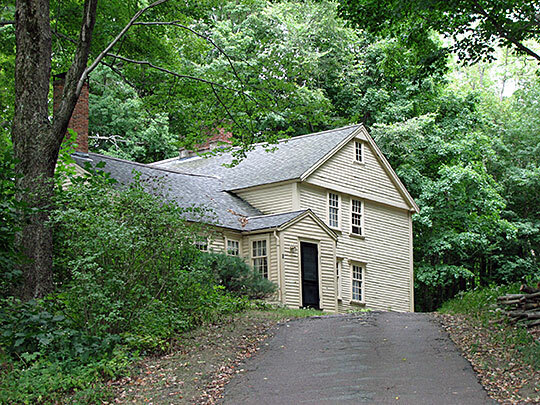 A meetinghouse was built in the center of Town with roads coming from the outlying farms. Although Acton was primarily an agricultural community in its early days, residents were involved in a range of other economic activities, including sawmills, gristmills, the manufacture of barrels to store and ship foodstuffs, a pencil factory, and even a woolen industry centered on the Faulkner Mills in South Acton; one of the first large-scale manufacturers of woolen cloth in this country. Remnants of that original mill still exist. Only with the arrival of the railroad did the villages really begin to grow, especially West Acton Village. It wasn't until after the Civil War that the railroad finally went through East and North Acton. The rail beds remain today and are locations for the proposed Assabet River Rail Trail and Bruce Freeman Rail Trail. The 1890s brought a shift in population towards South and West Acton, which caused the precincts and school districts to be realigned. The North and East District Schools were combined into the Center District. Although the districts were officially changed the residents still thought of the villages as East and North Acton. At the turn of the century Acton was still an agricultural community, with five villages and a population of 2,120. Apples were Acton's main agricultural export being shipped not only to Boston but to Europe. Before modern refrigeration, space in the cellar of the Town Hall was auctioned off for storage. Apples were stored in the center of West Acton into the 1950s. Improvements were coming however; a water district was formed in 1912 for West and South Acton; the Center was added later. A Town fire department, starting in 1915 with West Acton, replaced the independent fire companies. 1950 marks the shift from apples to houses, with most of that development in the southern half of the Town. There were 3,500 people in Acton in 1950; by 1974 there would be 17,000. The orchards and open fields turned into subdivisions; although Acton still kept its agricultural ties, with apples being a major crop into the 1960s. The Town was then three villages; Acton Center, West Acton and South Acton. Town of Acton, Massachusetts, prepared by Collaborative, Inc. and Community Circle, Acton 2020 Comprehensive Community Plan: Brief History of Acton, 2012, www.acton-ma.gov, accessed May, 2013.